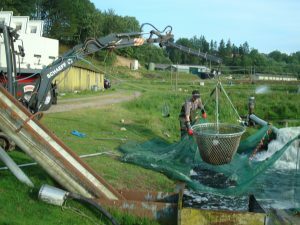 The Net-fishweigher is a efficient solution to weighing and loading fish by the pond. By the use of a small bob-cat equipped with the weighing system and a net, large quantity of fish can be weighed and loaded in a small span of time. The weighing system is powered by the 12Vdc supply on the Bob-cat. As an option, for independent operation, a build in battery can be supplied. The instrument can be set up for either automatic weighing or manual weighing. For the professional farmer who wish to register the data, a barcode scanner can be attached. By this client information, sort of fish and the quantity can be logged on a USB-drive. Storing the data on the USB-drive makes it easy to transfer the data to the Farm-PC.